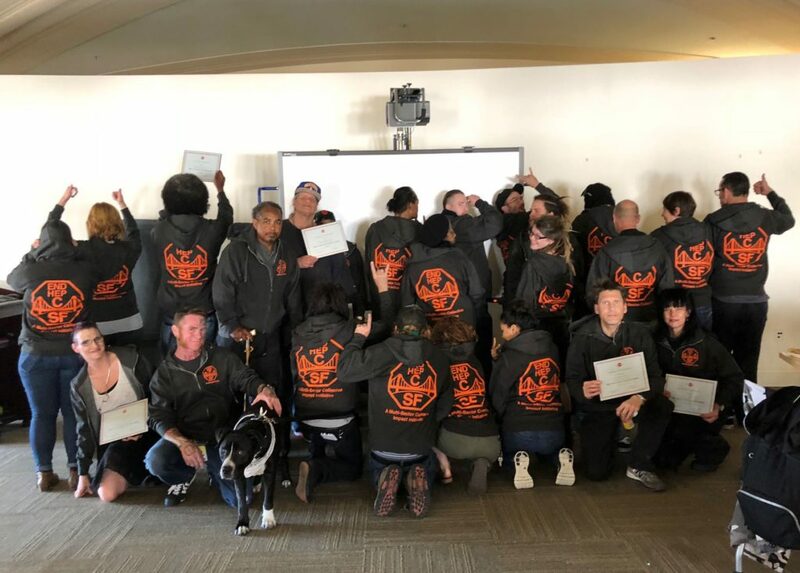 We had a wonderful group of 24 peers at our first ever training session, the launch of our peer navigation pilot programs with GLIDE, the San Francisco AIDS Foundation, and St. James Infirmary. On Wednesday we learned about boundaries and peer work from Charles Hawthorne from the Harm Reduction Coalition, then had a session on HCV 101 with our own Katie Burk. And on Thursday we heard from GLIDE’s Paul Harkin on the Cultural Competency Working with Drug Users, on Motivational Interviewing from Jeremy Prillitz of SFAF and from our own Emily Raganold on Data Hows and Whys. We enjoyed delicious food courtesy of Gilead both days and ended the training with a presentation of certificates and official End Hep C SF hoodies! Many thanks to our cohorts at St James Infirmary, GLIDE, and the San Francisco AIDS Foundation for helping us to make this happen, and to Gilead for funding our efforts! UPDATE: Congratulations to GLIDE, San Francisco AIDS Foundation, and St. James Infirmary, recipients of our $20k mini-grants to establish community-based peer navigation pilot programs. We’re excited to start working with you on this important step in HCV elimination! 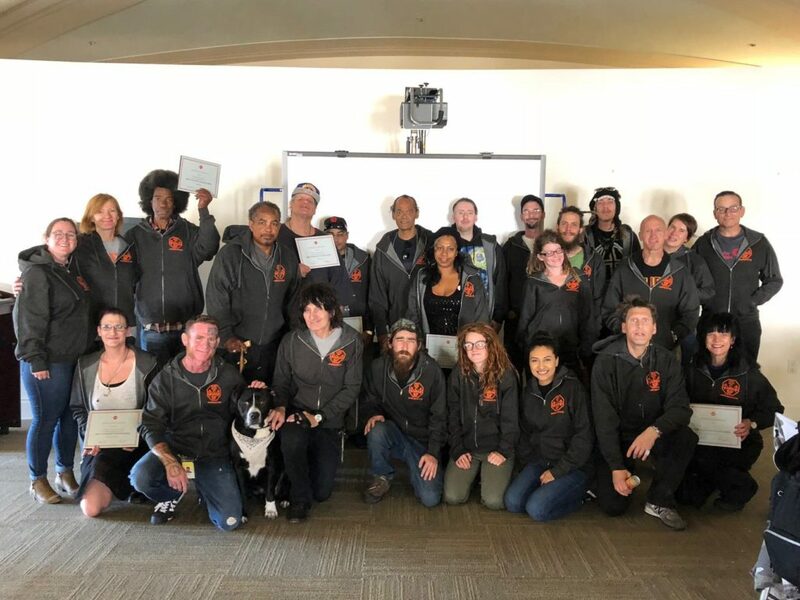 End Hep C SF is very excited to release our first Request for Proposals (RFP), seeking to award up to 4 mini-grants of up to $20,000 to establish community-based peer navigation pilot programs. Proposals are due April 13, and programs are expected to start on July 1, with at least 9 months of peer-based navigation services to groups that are highly impacted by hepatitis C. Please click here to download the RFP, which has details of how to apply. Please send any questions to jkay@projectinform.org, or by commenting below. We will post all questions and answers on this page as soon as possible. Q: Does the grant work have to be done only in the City and County of San Francisco? Or can we expand to the East Bay as well? A: We’re funded to do peer-based linkage work in San Francisco, so all activities should be focused there. Thanks. Q: Do we have to do HCV testing ourselves? What if we can’t do that? A: The RFP asks that if your program doesn’t provide testing onsite, you have a partnership with an agency, program, or clinic that can provide testing for the folks you link. Q: What is this project trying to learn? 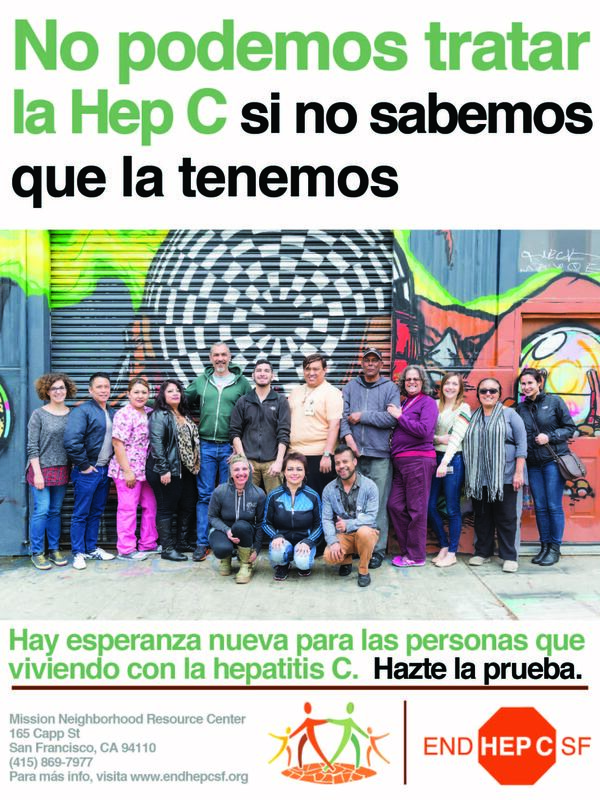 A: End Hep C SF is eager to harness the power of peers to help us not only find folks and get them tested and treated for HCV, but also to change the culture of the way HCV is thought about or treated in SF. We hope this program helps us find people to take advantage of services who we haven’t reached with existing programs. We also hope the peer navigation programs will help in shifting the way HCV is thought about and dealt with, so that if individuals discover they have HCV, they are aware they can and should be treated and initiate treatment soon thereafter. Q: How is “successful linkage” defined? And does linkage include clients accessing medical/DMV/public benefit appointments—or just medical appointments that include HCV tx? A: “Successful linkage” refers to having a client/patient attend their first appointment with primary care or other provider that treats HCV (recognizing that HCV can be treated outside of primary or specialty care in SF). Programs will be required to track this outcome. Tracking of other outcomes is desired but not mandatory, such as starting and completing treatment. Q: Please clarify the core training which will be part of all peer training. What is the curriculum (if available) and time each week? What is the timeline for the training? e.g. will it be five days a week and how many hours each day? A: The End Hep C SF Prevention Testing Linkage group recommended creating a core training that all the peers can participate in to minimize each agency’s individual curriculum development efforts. The peer trainings will include sections on HCV overview, client-centered counseling/motivational interviewing, cultural competency with high-risk populations, harm reduction and data collection. The curricula will be truncated versions of existing curricula from various trainings. The training schedule is not yet worked out but will occur in the first months of programming. Shortly after programs have been funded, representatives from funded agencies will meet to decide on a training schedule that is most agreeable to the agencies funded. Q: How are you defining “linked to care” in this RFP? A: “Linked to care” refers to having a client/patient make their first appointment with primary care or a provider that treats HCV. We hope that programs will be able to track if folks start and complete treatment too, but we understand that making treatment decisions and timing are outside the purview of the peer navigators. So linking just means getting folks in the door to see the providers.